Nadia finally realised she had a problem when she killed off the Wiggles. Overwhelmed, she left three-year-old Alice and four-month-old Matthew with her husband and impetuously drove three hours north, turning up on my doorstep in tears. Her shoulders drooped and her body curled itself into the shape of a dejected question mark, mirroring her internal uncertainty. It was as if someone had stuck a pin in her usual tall, erect, striking frame and deflated her. What had happened to the proud, exuberant, compassionate Nadia I knew and loved; the woman who’d lit up every room she entered? What had extinguished her flame? A wave of panic rose inside me. I didn’t want to hear this. I didn’t want to know. I felt it wasn’t fair of her to dump all this on me, especially considering what I’d been through, but I knew it was something I couldn’t ignore. I also knew that her predicament was going to need far more than a cup of coffee and a reassuring chat with an old friend. Nadia and I had been close friends at university but our lives diverged in more ways than just geographically. Our frequency of contact dwindled slowly and then took a nose dive when her first child was born. She’d entered the “baby zone” before me and her life revolved around nappies and naps. Even when we managed a chat on the phone, our worlds were now worlds apart and we seemed to be going through only the obligatory motions. “Buy milk – tick, wash towels – tick, phone old friend – tick”. The disconnection was partly due to jealousy on my part, I’m ashamed to admit. As two ambitious, intelligent, capable and confident women, our friendship had always had an undertone of competitiveness. Being high achievers in different fields, there was no overt rivalry or envious feelings… until our reproductive discrepancies were revealed. Nadia sailed through her first pregnancy, popped out a perfect infant without so much as a perineal stitch and took to motherhood like a duck to water. Little Alice was angelic: sleeping, feeding and poo-ing like clockwork, with barely a cry to be heard. Nadia attributed her good luck to good management, which added fuel to my already blazing resentment. While she was gliding effortlessly through the motherhood pool, I was still at the starting blocks after a series of false starts. By the time she became pregnant for the second time (exactly as she’d planned – when Alice was two), I’d had three miscarriages and was pregnant for the fourth time. Our due dates were three days apart and for three joyous months Nadia and I were back in sync, our orbits having realigned in a most positive way. At fourteen weeks of pregnancy my world was thrown off course with a fourth miscarriage, and Nadia was the last person on earth I wanted to see. I heard second-hand that she’d had another trouble-free pregnancy and delivery and that, as hoped, had been blessed with a healthy baby boy. I managed to send an e-card. I had not spoken to her for over six months when she turned up out of the blue that summer’s day. I have to admit, part of me was thinking the same thing. I was the one who had earned the right to be miserable, not her. She had everything I wanted in life and I would have swapped my life for hers in a heartbeat. However, as she continued to bare her soul, overwhelming feelings of sympathy and empathy pushed aside my complex set of emotions and washed away the tiny kernel of shameful schadenfreude I knew I had to help. From the breastfeeding zealot who’d fed her daughter for eighteen months, this spoke volumes. Luckily I was able to get her an urgent appointment with my GP for the following day. In the interim, we turned to the Internet. I tried to reassure her with platitudes but I was quite obviously out of my depth. Over the following 24 hours, she didn’t talk much either. She didn’t do much of anything actually – didn’t eat, didn’t sleep, didn’t cry. It was as if she’d expended all of her energy getting to where she felt safe and had nothing left in the tank. I watched on helplessly as, like a wind-up toy that needed re-winding, she slowed almost to a standstill. The following day Nadia was hospitalised, as there were grave concerns about her risk of self-harm. I have to admit that I felt a huge sense of relief to have the responsibility for her care lifted from my shoulders. After two weeks of antidepressants she started to improve in leaps and bounds and was discharged, although it took at least another month before she started to regain her maternal confidence. After that there was no stopping her. The exuberant, capable Nadia was back. Two years later and off medication for six months, her glass has remained very much half full. She’s been strengthened by the experience, as a woman and as a mother, and yet still feels a sense of shame. If I hadn’t been personally involved, I might have made similar comments. Instead, thanks to my encounter with Nadia and some self-education, I came to realise that I too was suffering PND after my miscarriages. The black dog wears many hats. Just as there are many different manifestations of PND, a one-size-fits-all treatment approach doesn’t work. For Nadia, the key to recovery was high-dose antidepressant medication. She didn’t find psychological therapies or self-help strategies particularly helpful. The opposite was true for me. 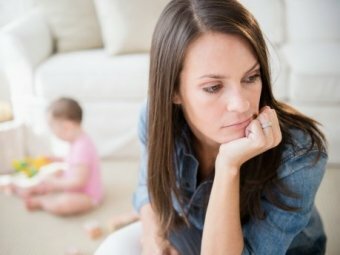 I think it would have helped each of us had we known earlier that postnatal depression is not indicative of bad parenting or a sign of failure; knowing that while there are risk factors, it can happen to anyone who’s had a pregnancy. It can be unpredictable and has the ability to cripple even the most confident, capable and resilient. It happened to Nadia. It happened to me. It could happen to any of us. This entry was posted in Blog posts and tagged creative writing, postnatal depression by Genevieve Yates. Bookmark the permalink.